The race between two key chip makers to put self-driving cars on the streets is getting heated. And it’s no less entertaining, involving the likes of BB8, a self-driving Nvidia car named after a droid in Star Wars, and the company’s automotive supercomputer called Xavier, named after an X-men superhero. These two playfully named products are a big part of Nvidia’s ambitious plans to put a fleet of self-driving cars on the streets by 2020. Nvidia is collaborating with Audi to develop these autonomous cars, which will be based on the Drive-PX computer. Nvidia’s announcement comes just a day after Intel and BMW said they were putting 40 self-driving cars on the street by the end of this year. Those are test vehicles, but a big change from Intel’s earlier plans to put the first self-driving cars on the street by 2021. But Nvidia already has the BB8 self-driving car test driving the streets of Northern California. It will also been shown on the CES show floor. The BB8 autonomous car was taped cruising to a Starbucks, and the ride was shown in a video during Nvidia CEO Jen-Hsun Huang’s keynote at CES. The car was riding the side streets, highways, making exits and recognizing signs and signals. The car automatically steered as a nervous looking man sat at the wheel. BB8 is an early prototype of what Nvidia calls an AI car, a glorified name for an autonomous vehicle. Cars are being equipped with powerful computers to make smart driving decisions and avoid accidents. Like with BB8, computers are helping cars recognize signals, objects, pedestrians, signs, terrain and other things in the line of sight. Intel and Nvidia are also competing in the race to plug more horsepower into cars. Intel on Tuesday at CES announced the Go computers for cars with up to 28 Xeon cores and 5G connectivity into vehicles, while Nvidia for the first time showed off its next-generation Xavier computer, which has eight ARM CPU cores and a 512-core GPU based on the next-generation Volta graphics architecture. It will succeed the Drive PX-2, which was introduced at last year’s CES. 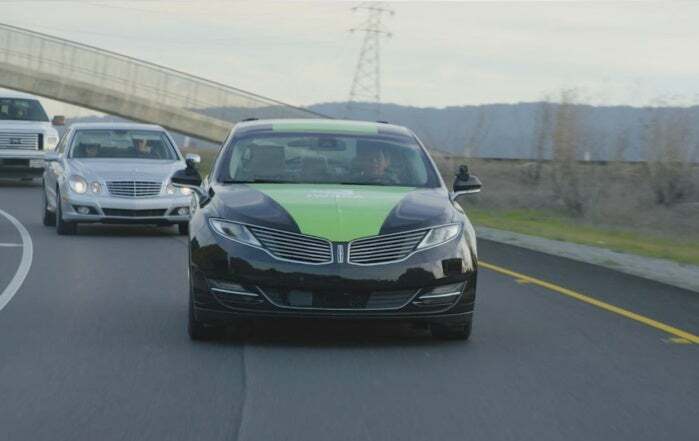 Nvidia has also touted its technology called “AI co-pilot”, which is a slightly intrusive but interesting technology to make driving safe for drivers and passengers. Instead of tracking the outside, the AI copilot would monitor the conditions inside a car. Here’s how AI copilot works: Nvidia envisions the internals of the cars being equipped with speakers, cameras, microphones, lidar, radar and other sensors. The AI copilot could analyze data collected from all those sources to check the state of the driver. For example, the AI copilot may conclude a driver is sleepy based on sounds from the person and images of droopy eyes, which means it’s time to stop driving. Huang said that AI copilot is “looking out for you.” It’s still prototype technology. Intel and Nvidia are also aggressively chasing 3D mapping, which is important for self-driving cars to navigate. Mapping is considered especially important for self-driving taxis, like the ones being pursued by Uber, which need to establish routes between points. Nvidia said it was collaborating on 3D mapping with a company called Here, in which Intel acquired a 15 percent stake on Tuesday. Here’s shareholders also include Audi, BMW, and Daimler. Nvidia has also been working closely with Baidu, which is involved in mapping in China.